The first-ever Geneva Convention governing the sick and wounded members of armed forces was signed in Geneva in 1864. The First Geneva Convention for the Amelioration of the Condition of the Wounded in Armies in the Field, held on 22 August 1864, is the first of four treaties of the Geneva Conventions. It defines "the basis on which rest the rules of international law for the protection of the victims of armed conflicts." After the first treaty was adopted in 1864, it was significantly revised and replaced in 1906, 1929, and finally 1949. It is inextricably linked to the International Committee of the Red Cross, which is both the instigator for the inception and enforcer of the articles in these conventions. The 1864 Geneva Convention was instituted at a critical period in European political and military history. Elsewhere, the American Civil War had been raging since 1861 (starting with the Battle of Fort Sumter), and would ultimately claim between 750,000–900,000 lives. Between the fall of the first Napoleon at the Battle of Waterloo in 1815 and the rise of his nephew in the Italian campaign of 1859, the powers had maintained peace in western Europe. Yet, with the 1853–1856 conflict in the Crimea, war had returned to Europe, and while those troubles were "in a distant and inaccessible region" northern Italy was "so accessible from all parts of western Europe that it instantly filled with curious observers;" while the bloodshed was not excessive the sight of it was unfamiliar and shocking. Despite its intent of ameliorating the ravages of war, the inception of the 1864 Geneva Convention inaugurated "a renewal of military activity on a large scale, to which the people of western Europe…had not been accustomed since the first Napoleon had been eliminated." The movement for an international set of laws governing the treatment and care for the wounded and prisoners of war began when relief activist Henry Dunant witnessed the Battle of Solferino in 1859, fought between French-Piedmontese and Austrian armies in Northern Italy. The subsequent suffering of 40,000 wounded soldiers left on the field due to lack of facilities, personnel, and truces to give them medical aid moved Dunant into action. Upon return to Geneva, Dunant published his account Un Souvenir de Solferino and, through his membership in the Geneva Society for Public Welfare, he urged the calling together of an international conference and soon helped found the International Committee of the Red Cross in 1863. The International Committee of the Red Cross (ICRC), while recognising that it is "primarily the duty and responsibility of a nation to safeguard the health and physical well-being of its own people", knew there would always, especially in times of war, be a "need for voluntary agencies to supplement…the official agencies charged with these responsibilities in every country." To ensure that its mission was widely accepted, it required a body of rules to govern its own activities and those of the involved belligerent parties. United Kingdom of Norway and Sweden signed in December. the recognition of the Red Cross symbol as a means of identifying persons and equipment covered by the agreement. Due to significant ambiguities in the articles with certain terms and concepts and even more so to the rapidly developing nature of war and military technology, the original articles had to be revised and expanded, largely at the Second Geneva Conference in 1906 and Hague Conventions of 1899 and 1907 which extended the articles to maritime warfare. The 1906 version was updated and replaced by the 1929 version when minor modifications were made to it. It was again updated and replaced by the 1949 version, better known as the Final Act of Geneva Conference, 1949. However, as Jean S. Pictet, Director of the International Committee of the Red Cross, noted in 1951, "the law, however, always lags behind charity; it is tardy in conforming with life's realities and the needs of humankind", as such it is the duty of the Red Cross "to assist in the widening the scope of law, on the assumption that…law will retain its value", principally through the revision and expansion of these basic principles of the original Geneva Convention. Article 12 mandates that wounded and sick soldiers who are out of the battle should be humanely treated, and in particular should not be killed, injured, tortured, or subjected to biological experimentation. [dubious – discuss] This article is the keystone of the treaty, and defines the principles from which most of the treaty is derived, including the obligation to respect medical units and establishments (Chapter III), the personnel entrusted with the care of the wounded (Chapter IV), buildings and material (Chapter V), medical transports (Chapter VI), and the protective sign (Chapter VII). Article 15 mandates that wounded and sick soldiers should be collected, cared for, and protected, though they may also become prisoners of war. Article 16 mandates that parties to the conflict should record the identity of the dead and wounded, and transmit this information to the opposing party. Article 9 allows the International Red Cross "or any other impartial humanitarian organization" to provide protection and relief of wounded and sick soldiers, as well as medical and religious personnel. For a detailed discussion of each article of the treaty, see the original text and the commentary. There are currently 196 countries party to the 1949 Geneva Conventions, including this first treaty but also including the other three. ^ "Convention for the Amelioration of the Condition of the Wounded in Armies in the Field. Geneva, 22 August 1864". Geneva, Switzerland: International Committee of the Red Cross ICRC. Retrieved 11 June 2017. ^ Encyclopædia Britannica, s.v. 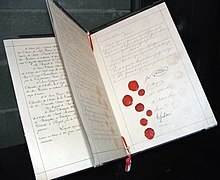 "Geneva Conventions", http://search.eb.com/ (accessed 10 March 2009). ^ Encyclopædia Britannica, "Geneva Conventions". ^ "Final Act of the Diplomatic Conference of Geneva, 12 August 1949". Geneva, Switzerland: International Committee of the Red Cross ICRC. Retrieved 11 June 2017. ^ a b Pictet, Jean (1958). Geneva Conventions of 12 August 1949: Commentary. International Committee of the Red Cross. Retrieved 20 November 2009. ^ "Convention (I) for the Amelioration of the Condition of the Wounded and Sick in Armed Forces in the Field. Geneva, 12 August 1949". Geneva, Switzerland. Retrieved 11 June 2017. ^ "States party to the main treaties". The American National Red Cross. Retrieved 5 December 2009. Francis Lieber, "INSTRUCTIONS FOR THE GOVERNMENT OF ARMIES OF THE UNITED STATES IN THE FIELD", Lincoln General Orders, 24 April 1863.